Iceland is currently a closed electricity market with no cable connections to other markets. This may soon change. Technology advancement, strong demand for more renewable energy, and high electricity prices in Europe are making a submarine high voltage direct current (HVDC) cable between Iceland and Europe more feasible than ever before. Iceland can substantially increase its green electric power production at a reasonable cost. Iceland is the only country in Western Europe that still has several large unharnessed hydro power options. Also, Iceland’s geophysical conditions offer numerous possibilities for low cost utilization of geothermal power, and Iceland has stronger and more stable winds than most of Europe. Some of this natural energy will be harnessed for varied domestic industries, such as new data centers, metallurgical-grade silicon production, etc. Iceland also has the possibility to do business with electric power through a submarine cable to Europe. Such a connection would not only be based on Icelandic hydro- and geothermal power, but would open up the possibility of large-scale harnessing of Icelandic wind power. So far the longest submarine HVDC-cable is the NorNed between Norway and the Netherlands (580 km / 369 miles). The interconnector between Iceland and Europe would be at least double that length, so it will definitely be a challenging project. Such an interconnector would not only enable sales of renewable electricity at high prices but also have various other benefits for the Icelandic electricity system, such as more efficient use of the generation capacity and enhance the security of supply. Currently, three scenarios are being studied. The first concerns an interconnector that would be used for export/import only, based on market prices. The second involves a cable used for export only, and the third assumes an interconnector used in part for export/import and in part for export. The main drivers behind an electric cable between Iceland and Europe are high electricity prices in Western Europe and the growing demand in Europe for more renewable energy. According to engineering and management firm Parsons Brinckerhoff and consultancy firm Mott MacDonald Group, as presented by Landsvirkjun, Iceland’s electricity prices are much lower than can possible be offered by new electricity generation projects in the United Kingdom (UK). This is especially interesting when having in mind UK’s energy policy, with the goal of increasing its renewable energy consumption from the present 54 TWh to 234 TWh no later than 2020. This goal, which is based on European Union’s (EU) and UK’s energy policy, will only be achieved with major investments in new green energy projects. Those projects will for example include very expensive and controversial onshore and offshore wind farms in the UK. For example, the minimum cost for offshore wind electricity in the UK is equivalent to 233 USD/MWh. 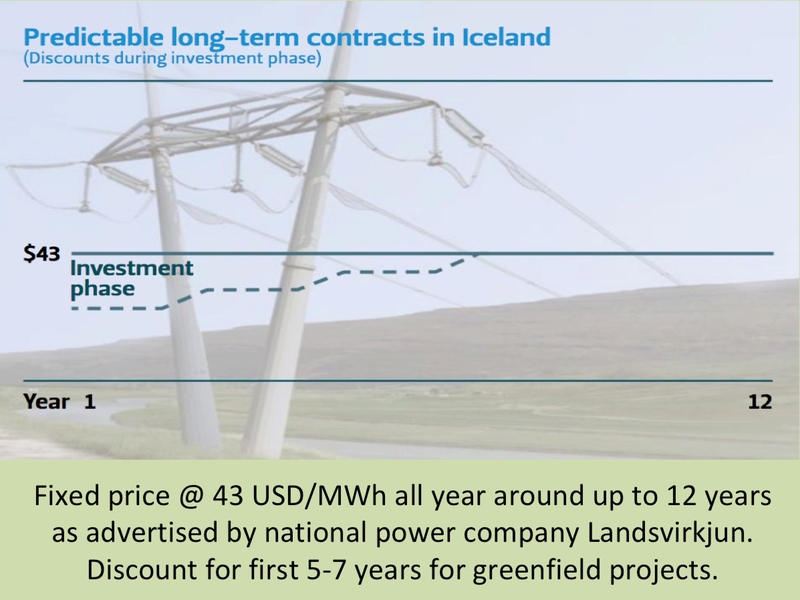 When comparing this to Icelandic renewable energy cost, it is quite obvious that an electric cable between Iceland and UK is an exciting option (Icelandic Landsvirkjun is currently offering long-term electricity contracts at 43 USD/MWh). Thus, it is not surprising that Mr. Hörður Arnarson, CEO of Landsvirkjun, has described the laying of a submarine cable to Europe, together with vigorous industrial development in Iceland, as probably being “one of the biggest business opportunities Iceland has faced”. The two charts above are from a presentation by Landsvirkjun, given at an energy seminar in Reykjavik in last May (2012).